I am not sure I can really call this posting a blog. Having just Googled the term, it would appear the word ‘regular ‘ is somewhat key … ‘written in an informal or conversational style’…okay I might just get a pass mark on that one…but on regularity I have failed. But there is nothing more annoying than… not being able to push/empty a wheelbarrow (well for me that is). Thankfully Ben (son) has been able to help some days, and between Paul and I (with my bad back) we just about make one whole. Actually we have become quite a team, although I know he is dying to complain about my reverse parking….I can see the will-power it is taking to say nothing! 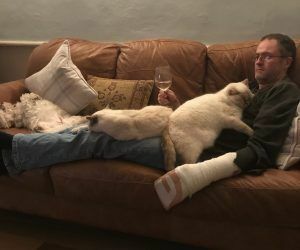 Paul with his cats and dog…oh and a glass of wine!! We have had some good news regarding Beck Brow Bottoms Up. Bottom had a c-section in the summer after failing to dilate. All went well at the time, but we noticed a herniation a couple of months later. 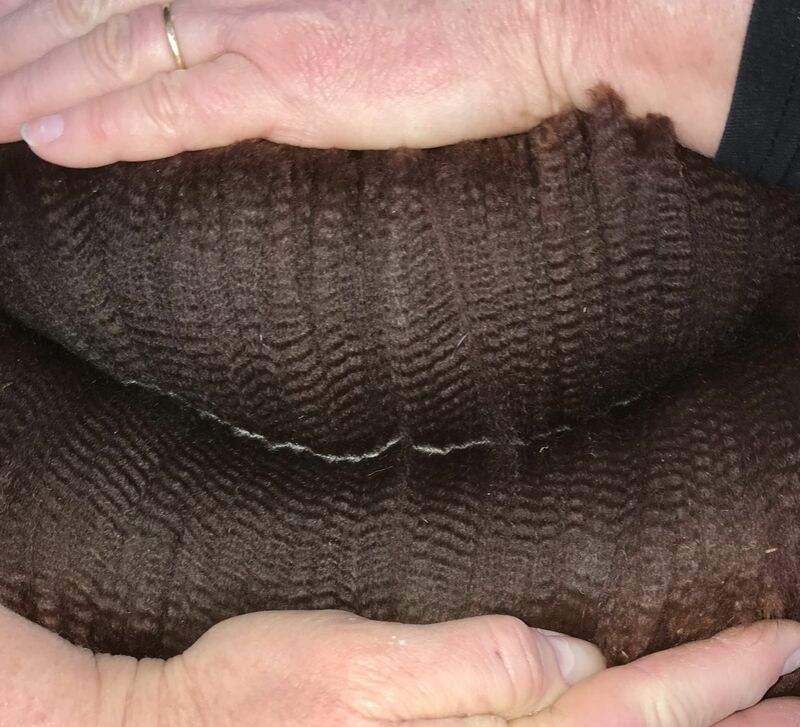 We had her scanned and it was confirmed that some of the internal stitches had burst. 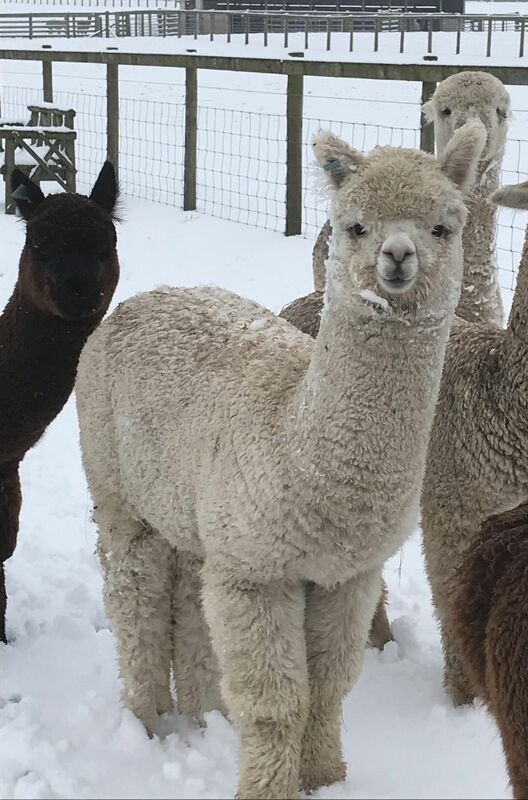 It was decided that as she was in no immediate danger, we would wait until her cria was weaned before operating. Thus Bottom was booked in for surgery in early January. Now Bottom is one of my favourites. She is from the Honaria line of Champions (First Edition, Bottoms Up, Bedazzle, Ditto) not only this, she is very sweet. I admit I was a tad apprehensive. But good news on examination…it had fixed it’s self. Only a very small infection was found where one of the external stitches had not been removed. We have flushed this daily with salt water and and inserted Instagel, and it is now almost clear. Bottom is such a poppet, she willing goes in to the catch pen for treatment each day, and Paul has realised, that as soon as I say ‘that’s it’ she takes a step forward to leave. Bless. 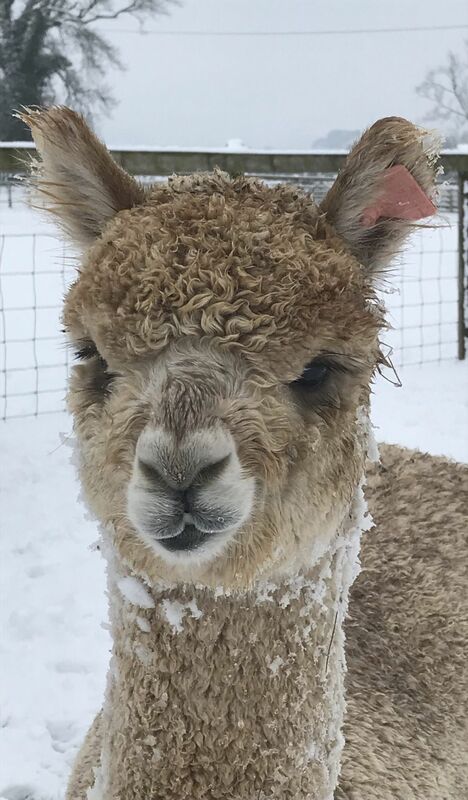 Along with every other alpaca breeder in the country, it would seem, we have ran out of AD& E vitamin paste. Supplies are short due to a fire destroying a factory in Germany, or so I am told. We had some injectable Hipravit in stock (which we use when we see any signs of potential leg angulation) but have order more bottles. It does take rather longer when there are 140 needle changes to be done. I know there are reusable needles out there, but the Intensive Care Nurse in me just can’t go there! On the subject of AD&E we have decided that we shall be administering vitamins to any growing stock during the April – September period, as well as over winter. So often we start to see some leg angulation late summer, we just don’t have the sunshine up north! I am so glad that the BAS National Show entries (naming of actual alpacas) has now closed. Now I can no longer change my mind. Well I can change my mind (as I did this morning) but it’s tough luck. The names are in. That’s who’s going. How difficult can it be to choose 18 alpacas. Very difficult it seems. 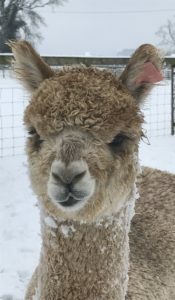 If you discount pregnant females (as we don’t show them) and all the alpacas that we have sold recently, it doesn’t leave too many, but it took some deliberation! We have entered progeny from eight different sires, so a good mix across the colours and breeds. I do think this year’s National Show will be the toughest yet. 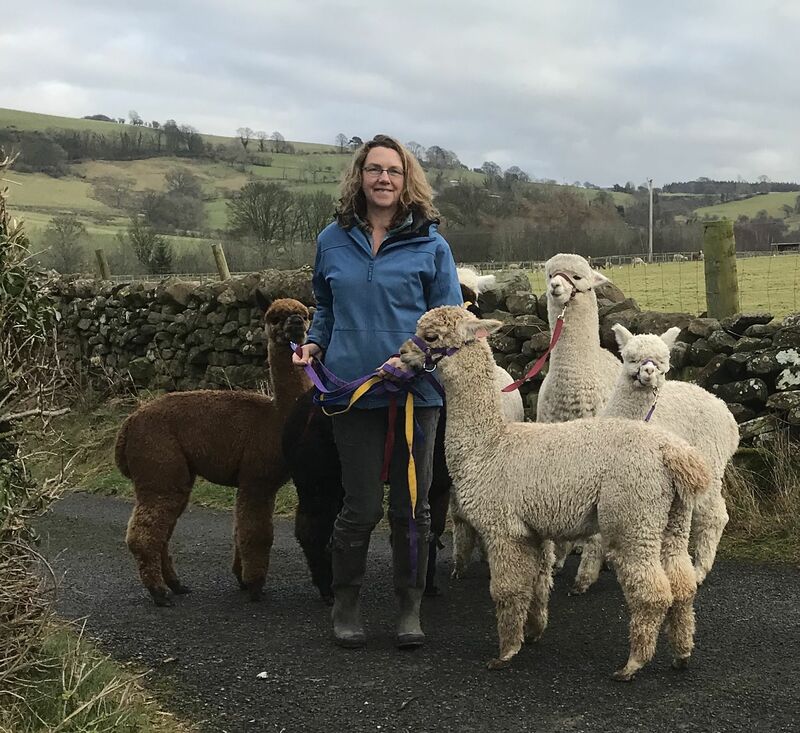 There are 600 entries in the halter show, and as neither of the UK judges breed from the light side (i.e no large herds breeding across the colours will be excluded due to their owner judging) it really is going to showcase some of the very best alpacas in the UK. 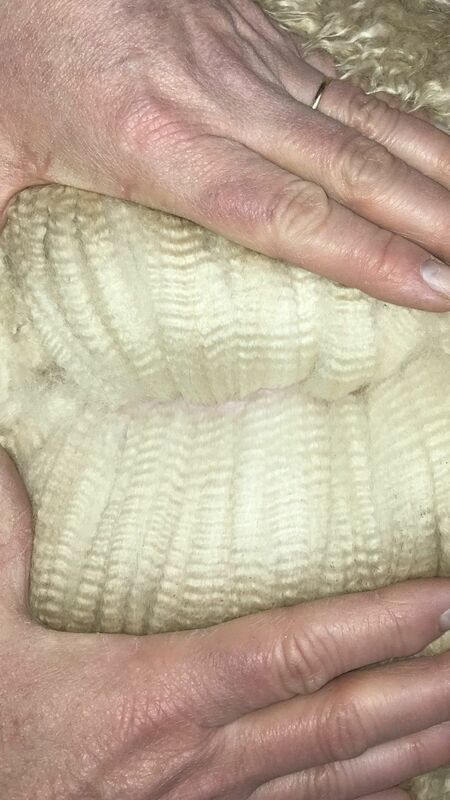 Add to that the fleece show, which includes those who do not attend halter shows, and we should have a fantastic exhibition. It hasn’t been great weather for choosing a show team…. The BAS National Show Stud auction commences next Monday (19th). The funds generated from the auction are essential for the show, so let us hope it as well supported as always. Beck Brow First Edition (Multi-Supreme Champion) is included in the first week. I must say that he is looking fabulous, especially as he is now a senior. Well in truth I really mustn’t say any such thing…they say modesty gets you no where…but I am not sure about that. Blowing ones own trumpet is all well and good…but can be quite painful when someone tells you where to stick it. So I will just say he is looking rather nice. Suffice to say his first two progeny on the ground, have resulted in many more progeny expected in 2018 (for me…our most exciting prospects). Both will be attending the National Show.